So it seems that we all enjoyed loosing ourselves in a true gothic classic! Every week I'll be rounding up the the Twitter bookclub discussion on the blog. If you want to get involved in the live Twitter chat, we will be discussing the book every Monday at 8.00pm GMT, although watch the #HOEWbookclub for any timing changes. If you are following along with us, you have read up to Chapter 7. You've travelled with Jonathan Harker to Dracula's Castle, been haunted by his descriptive diary narrative and noticed that there is something very different about Dracula. Our Twitter chat threw up some interesting points with many of us surprised at how scary we found the narrative. Considering how much we know, read and watch about Vampires I guess many of us felt this reading this would be like watching a badly-made-50-year-old-movie! Stoker is extremely descriptive which encourages the reader to paint and imagine such a vivid picture in their minds that it is almost impossible not to get swept along in his narrative. As @janeylambert the "real time" description makes you feel as though you are living Harker's every experience. I felt the same as @Lady_Louise_ when Harker tells of being trapped within the castle. As Louise put it, it makes you frustrated. Stocker certainly knows how to write a thriller! No wonder this novel has been such a huge success and so many thrilling stories inspired by his work. 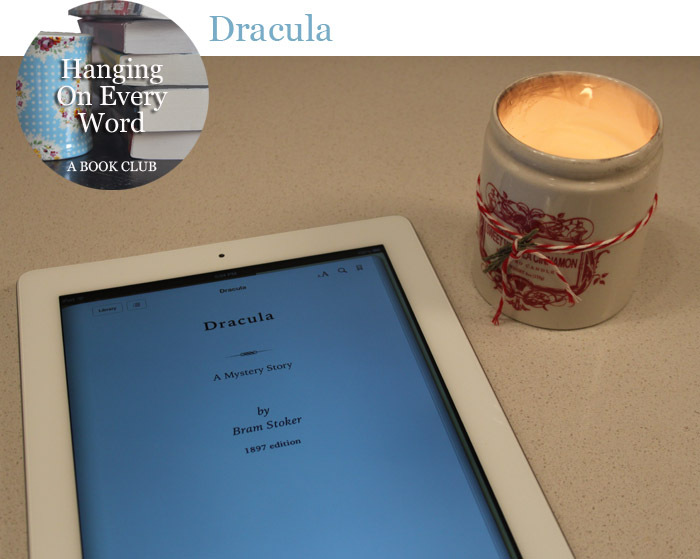 @janeylambert and @DaddaCool both make very good points around the fact that Dracula is an original story that invented many of the cliches and the vampire myth itself! The conversation rounded off speculating about how the female characters are to play a part in the story line. The female characters add another dimension to Stoker's tale. The first Twitter conversation was a great success, even teasing us to believe we were trending! Thanks for joining in with us. Feel free to continue the discussion and add your thoughts in the comments below. Next Monday we will be discussing up to chapter 15! See you next week - remember to use the #HOEWbookclub hashtag.